I first heard about this book when a friend told me I had to read Gaia’s garden! She said the garden layout and design described were unlike anything she had ever heard of before, and she loved it! After several other endorsements from friends, I bought a copy and have thoroughly enjoyed it. This book shows us how to take all those fragmented parts of our gardens and ‘integrate them into a vigorous, thriving backyard ecosystem’. Hemenway tells us that the word permaculture is a contraction of ‘permanent culture and permanent agriculture. It is a method of designing landscapes that are modeled after nature. I love the idea of copying natural designs and quoted Hemenway’s thoughts on this subject in an earlier post. He reminds us that ‘nothing in nature does just one thing’, yet we plant a tree for shade, a shrub for berries or a trellis for support only. We can design our gardens so that each piece plays many roles, letting nature do most of the work. Less work for the gardener? Sounds like a good plan to me! Hemenway provides us with a list of the roles that plants play in the ecological garden. Mulch Makers—Composting in place by soft-leaved plants such as comfrey, ferns, reeds, nasturtium and ‘green manure’ cover crops—clover, vetch, grasses and grains. Nutrient Accumulators—These plants draw specific nutrients from deep in the soil and concentrate them in their leaves. Included are yarrow, chamomile, fennel, lamb’s quarters, chicory, dandelion and plantain. Nitrogen Fixers—Another soil-builder, these plants convert nitrogen from the air into a usable form. Most plants in the pea and bean family are nitrogen fixers, as well as ceanothus, eleagnus, black locust, alder and acacia. Soil Fumigants and Pest Repellents—These plants secrete compounds that repel specific pests that live in or just above the soil. Examples include nasturtium, false indigo, elderberry, and certain marigolds. Insectory Plants—Attractive to beneficial insects to improve the garden’s health. Almost any pollen or nectar producing flower fits into this category. Fortress Plants—Species that prevent invasive plants from coming into more delicate areas of the garden. Comfrey, Jerusalem Artichoke, Lemongrass, Red-Hot Poker and Maximilian Sunflower. Spike Roots—Plants that have deep, soil-busting taproots can restore tilth to compact clayey soils. Examples are daikon, chicory, comfrey, artichoke and dandelion. Mustard, rapeseed and alfalfa have fibrous roots system that performs the same job. Wildlife Nurturers—These plants shelter and feed birds, mammals and butterflies. Dogwood, elderberry, chokeberry, blueberry, native roses, hawthorn and ceanothus. Shelterbelters—Plants that create windbreaks and shelter and keep out unwanted browsers or unwanted views. Also to create u-shaped sun traps. I really enjoyed reading a description of permaculture in action from the Flowering Tree Permaculture Institute in New Mexico. This is a hot, dry landscape, but, in Hemenway’s words….”I entered the yard through a gap between arching trees, and the temperature plummeted. The air here was fresh, cool, and moist, unlike the dusty, sinus-withering stuff I’d been breathing outside. A canopy of walnut trees, pinon pine, and New Mexico black locust sheltered a lush understory of pomegranates, nectarines, jujube trees, and almonds. An edible passionflower swarmed up a rock wall. Grapevines arched over an entry trellis. Two small ponds sparkled with rainwater caught by the adobe house’s roof. Winking brightly from under shrubs and along pathways were endless varieties of flowers, both native and exotic.” ‘The gardeners had rejuvenated a battered plot of desert, created a thick layer of rich soil, and brought immense biodiversity to a once-impoverished place.’ This sounds like gardening at it’s best and I want to learn how to create such a sanctuary. There is so much information packed into this 313 page book, it took me quite a long time to make my way through it. I treasure all of these words as a reference and wealth of new ideas. One idea that was new to me is the keyhole bed, or herb spiral. After I learned about these, I thought, duh! Why haven’t I been doing this for a long time? It makes so much sense! The idea is to take a row of plants and fold them up so they take up less space. The herb spiral coils up 20 or 30 linear feet of pathside plants into a helical pattern about 5 feet across and mounding. ‘The three dimensional helix does more than save space and effort. It’s mound shape means the herb spiral has slopes that face all directions. The sunny, south-facing slope will be hotter than the north and can be planted accordingly. Brilliant! 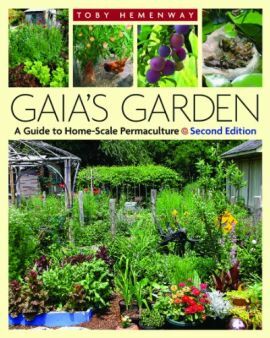 I highly recommend Gaia’s Garden for anyone who lives on this earth. Not the type of book to read quickly, but rather a reference to follow you through all the gardens of your life. Sounds really interesting – and I like the new look of your blog Elaine! Thanks, I was ready for a change! Yes, there is so much information. I hope to learn how to incorporate it into my own garden and other gardens that I’m involved with. I had seen this book mentioned and had it on my wish list…seems it may make it to the cart now for purchase…you have really piqued my interest in the ideas in the book.